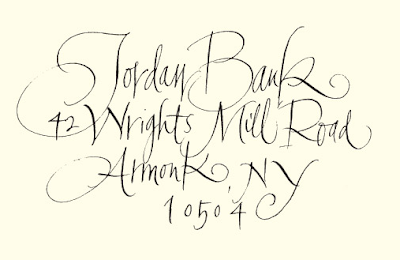 Just recently I hired one of my favorite calligraphers, Nancy Hopkins, to lend some of her amazing skills to a wedding invite job. 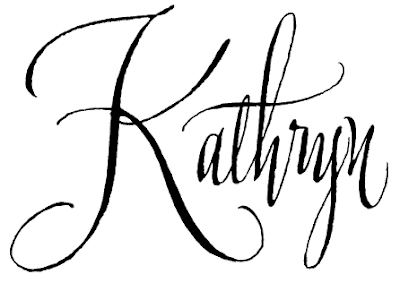 I felt that instead of using a script font, that it would be a nice touch to use her handwriting instead. So I asked my client to choose a style from Nancy's portfolio just like she would choose a font from my library. She ended up choosing this lovely free-flowing font called "Jordan"
My client loved how it came out especially the capital letters but felt the rest felt too condensed. 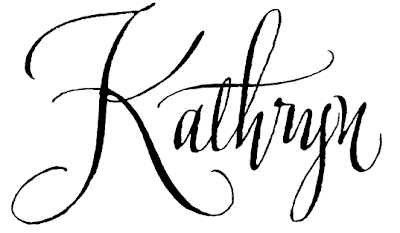 Unfortunately, calligraphy is a one-shot thing unlike digital fonts that come with different versions of the same typeface. It's a spontaneous artform where each letter will always vary from the next and unfortunately, in this case I was only given one version. Not having the extra time (or money in the budget) to have Nancy do a 2nd take, I decided to take matters into my own hands (with her permission) and manipulated the letters myself while hoping to keep the integrity of the calligraphy intact. Nice job Via! Subtle changes do make a HUGE difference.